When I work with publishers, I find authors hesitant to tinker with the mechanics of a task and eager instead to spread the “real world” over the task like a thin coat of varnish. Why are students bored by quartic equations in the problem I excerpted above? We are less eager to examine the structure of the task (which has been passed down and assumed constant for generations) and eager instead to just add stock photography of a snowboarder. Students aren’t so easily fooled. Similarly, when I find interesting real-world tasks that result in engaged, interested learners, the real world-ness of the task is often its least essential element. What’s “real” to you isn’t necessarily “real” to me. Our lived experiences are different. An example on the extremes: one of my favorite proof tasks is Bucky the Badger. Lots of teachers and students enjoy it. The context and the math are often interesting. But I took it to Australia two years ago and interest was quite a bit muted for reasons I should already have anticipated: they don’t do football like we do football. This obstacle to effective curriculum design isn’t insurmountable. Lots of great art has been made about contexts we’ve never experienced, for instance. But we assume this obstacle doesn’t exist at the expense of our students who haven’t been privileged with our life experiences. Take hexagons, health insurance, hydraulic engineering, hydrogen gas, and heptominoes. Is anybody here confident they can tell me which of these is “real” to a sixth grader? Which is “fake”? This is a self-limiting question. They can all be made real. We should be very, very hesitant to write off entire worlds as foreign and unknowable, especially the world of pure mathematics, which a student can always conjure up given nothing more than a mind, a pencil, and a piece of paper. The point of math class. The point of math class isn’t to build a student’s capacity to answer questions about the world outside the math classroom. It isn’t to prepare her to get a job either. Both of those are happy outcomes of a different goal that’s broader and more interesting to me. The point of math class is to build a student’s capacity to puzzle and unpuzzle herself – no matter what form those puzzles take. Find those puzzles in the real world, the fake world, the job world, or any other world – it doesn’t matter. 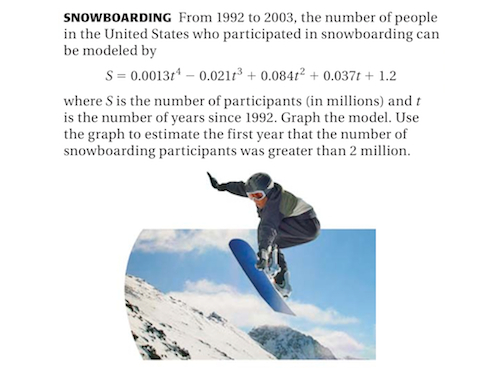 We see that the “real” equation about snowboards isn’t even real data! Opens up a whole discussion about not just taking the statistics that are fed to you by someone and believing them, but checking the facts! So, I’m wondering what you make of the liberal use in CCSS-M of the phrase “real-world problems” and the possibly even more ubiquitous star (modeling) symbol? Applications is 1/3 of the three-legged table of “rigor” as defined here and also every time I’ve seen Bill McCallum address more than 4 people. Here’s my perspective: real-world vs fake-world is not an argument worth having. Neither one is necessarily good or bad. Publishers have done a monstrous hack job of applications and real-world “problems” because what they publish are not really problems – they’re exercises dolled up with stock photography and decimal coefficients. What “applications” and “real-world” /ought to/ mean are that the symbols and numbers and diagrams a class is working with represent something that means something, and the relationship expressed means something, ideally because students generated it themselves. I don’t think it particularly matters if those things are instantiated by a question that civilians might legitimately wonder or if they spring more fully-formed from a puzzle/video/word problem/pile of sticks/whatever contrived by a math teacher. Contrast your lame textbook example with any of the modeling tasks on IM. here or here or here. Are these real world or fake world? Who cares? If used appropriately they’re legit problems (not exercises) and the symbols and relations mean something tangible. That’s a win. There’s an interesting bifurcation in what’s considered “real-world”. To me, if I can see it, touch it, or even imagine it, I’d consider that “real-world”. However, many think if there’s not economic utility (usually it’s economic utilitarian in nature) then it’s not real world. It’s the difference between Andrew’s awesome filing cabinet problem and filling out a tax form. Will I ever need to cover a filing cabinet with post-it notes? Will students? No, but it’s posed in such a way that a student can see it, imagine it, conjecture at it. That’s real world to me – although it doesn’t often resonate with district types. One coda in slight defense of the Fake World: I will say that having teachers attempt to develop their own “real-world” tasks 1) usually does result in “fake world” tasks, BUT 2) is often the first experience they’ve had designing their own tasks and starting to think about students’ interests, needs, and wants. Not that a problem like the one you cite is a lever, but that potentially problems that Kate cites from Illustrative Mathematics – and other psuedo-world problems – can be a teacher’s first step toward a journey toward student centered curricula. I am focusing on math as puzzles to be solved in my geometry class. Circles, in degree and radian, circumference and area, all present linguistic and conversion issues that kids struggle with. There are puzzles there – keys are found in the patterns and relationships of formula. I relate these measurements to round foods, or percentage discounts, or sectors of a particular group – women who buy high heels as part of a group of all women who buy all kinds of different shoes. No matter – what does matter is how interested is the student in solving the puzzle. How curious or challenged is he/she. Thanks for running down the data, Danny. At the very least, if textbooks are going to pursue this lousy “can be modeled by” framework for tasks, they should at least provide a citation to the data. In general, I think the phrase “real-world problems” is under-specified. I think “modeling” is very well-specified in the CCSS, especially at the high school level. Nothing in here is meant to discredit application problems, only to temper certain prevalent ideas about them. I’m not unenthusiastic about application problems but I am curious if McCallum would suggest that every standard even has an application to the world outside the math classroom. I hope not. In which case … what then for those? Here’s my perspective: real-world vs fake-world is not an argument worth having. Neither one is necessarily good or bad. Without any kind of data backing me up, I don’t think that’s a majority opinion. The premise of this (hopefully brief) series is that we don’t have a lot of well-articulated ideas for creating fake-world tasks that students enjoy. We also have a lot of poorly-articulated ideas about the real world that result in tasks students don’t enjoy. It’s the difference between Andrew’s awesome filing cabinet problem and filling out a tax form. Will I ever need to cover a filing cabinet with post-it notes? Will students? No, but it’s posed in such a way that a student can see it, imagine it, conjecture at it. That dissonance settles once I ask them to write down their best guess of how many stickies cover the thing and what’s a number they know is too high and too low and would you share that with your neighbors and what do we mean by “cover the thing” anyway? Real or fake – whatever it is – it’s been converted into a puzzle. Something puzzling. Which is all I need. In previous posts last year, you and your community came up with the idea of “is it perplexing?” as the proper test for the value of a prompt. I really like that expression. It covers all the bases as to why anyone should want to learn math. The word “puzzle” used in this post conjures up a narrower view of valuable prompts. Agreed on real/fake is not correlated with enjoyable/joyless. Interested to see where this goes. I think a problem we have discussing this issue is that we most likely don’t hold the same definitions of “real-world” and “fake-world” mathematical tasks. I doubt we could even all agree on what these definitions should be. For my part, I consider a “real-world” task to be something that a person would be doing in the course of their job or daily lives. As for the example you provided here, it could also be classified as “real-world” but with pseudocontextual characteristics. But who really knows, maybe someone, somewhere is sitting around modeling the number of snowboarders with quartic equations. The more pressing point is one that you made, that what is “real-world” to one person is not necessarily “real-world” to another. It only becomes “real-world” to a person if they have experience with it, like you mentioned. Even so, experience with a concept does not necessarily guarantee engagement for learning. Consider my middle school students: even if they already knew they wanted to be an engineer, or their parent was a scientist, it seems rather naive to assume that all 13- or 14-year olds could make the connection between the task at hand and needing it for their future career choice(s). (1) Students are more apt to be engaged if what they are learning will make their life easier. Does it solve a problem for them? (2) Students are more apt to be engaged if they are curious about something in the task. Why does that happen? (3) Students are more apt to be engaged if they have “buy-in” to the problem. Will it help them win a competition? Does if provide low-entry for maximum participation? Do they have ownership? I think it’s obvious that these characteristics are general in nature, and definitely won’t, and fact can’t, apply to ALL students. We developing a metric here for the larger (majority) group of students that doesn’t necessarily apply to the smaller groups of students that are dealing with other issues. In my case, this would be a cohort of students that are struggling with Maslow’s hierarchy of needs. But they are specific cases instead of the more generalized case. That dissonance settles once I ask them to write down their best guess of how many stickies cover the thing. What do we think is going on when you ask that question? How does an estimation question change how puzzling and interesting the question is? What’s the process? In the past you’ve answered that question using the concrete/abstract framework, but now I’m struggling to apply it. That question makes the task more concrete? So the theory is that people find concrete things interesting? At times, we’ve also suggested that offering a guess allows every student to have ownership over their particular answer, and then drives them through the rest of the task. So the increase in interest comes from a desire to show themselves be proven correct. Here the theory would be that people find opportunities to be correct interesting? I would (very tentatively) suggest another theory. How interesting we find a task depends on two factors: (a) How valuable we perceive the outcomes of the task to be, and (b) The likelihood of reaching that outcome. In this framework, what makes something like the File Cabinet problem interesting comes in two parts. First, there’s the perceived value of figuring out how many notes it would take to cover the cabinet. If you could answer that question, you would be really, really smart, because it’s a tough question. But, at first, the question seems really difficult, and the outcome seems unavailable. But then the question (“What’s a guess that’s too high?”) makes the task much easier by suggesting its connection to other things we know how to do. That rush is perplexity. It’s the release when you’ve gone from jealously looking on an outcome that’s incredibly difficult to obtain to seeing a way to go about achieving it. So what’s an uninteresting task? One that maximizes difficulty at the front, killing interest, and then progresses to make that knowledge extremely easy, common and available by being didactic. A bad task runs from one limiting case of this framework (high difficulty) to the other (low value). Is this hypothesis, then, directly related to the mindset of the student? A student with a growth mindset will find more tasks interesting and engaging than a student with a fixed mindset? Good & somewhat irrelevant information. The main question in my mind is still “The Point of Math Class”???????????? Why are you holding out on us, Gary? Can’t see how I’d do you wrong here since I’ve been ripping you off for basically a decade now! I am also searching for the meaning of math class. Love to hear more thoughts on that. I can see the point of math class for kindergarteners – basic addition, measurements, clocks, money. After that, fractions are interesting and useful. Rest seems a bit made up. Maybe we should be teaching programming instead. But, maybe programming is only fun because the standards writers haven’t got a hold of it yet. This might be restating a bit of what Kate said in comment #2, but the value of a context for a math problem has very little to do with how likely the context is to occur out in the wild. Getting caught up on whether or not a situation is realistic is using the wrong metric to assign value to a potential mathematical context. Using a specific mathematical idea or structure to model a live context (of ANY kind) requires a more complete understanding of the math than it takes to manipulate those structures in a repetitive, isolated manner out-of-context. So, the value of any potential mathematical context is related to its ability to force the students to model the context strategically to answer the question they guessed on before. Penny Circles might be a great way to achieve that end (regardless of the fact that the students run almost no risk of ever needing to count pennies in that way outside of math class). This is where contexts like the snow-board problem break down. While the context serves to support the application of the math, the textbook authors modeled the problem with an equation before the students had time to explore the context. The students should be writing the equation! The designing of the equation is the type of math that the context should be supporting. The authors undercut the potential value of their “real-world” situation. I think math is beautiful and love the patterns and aesthetic of doing it. Is that enough to make it a worthy task? Not really, but my students certainly gain an appreciation for math and know their brains are more capable at the end of class than when they walked in. I’m offering! But a) I don’t have people in Ukiah anymore and b) I’m sure folks here would like to know too. How about I owe you one? The ultimate point of math class (for many) is basically the ABC’s of accurate communication about the behavior of events that do not lend themselves to common language alone. Try describing the behavior of light, chemistry, sound, flight, economics, population dynamics, business, engineering, architecture, quadratic functions, gravity, or calculus without basic mathematics. How do I describe the behavior of sound waves (science) without understanding the sinusoid (mathematics). Try doing calculus without knowing algebra. Side note: Many medical doctors and CEO’s never use calculus, but would they have ever gotten their degree and position without passing calculus? Math is to science, business, economics, and engineering what the 26 letters of the alphabet are to the reading and writing of words, signs, sentences, paragraphs, pages, and books in the English language. The main goal in my math classes is to be prepared for the next level of math, chemistry, physics, economics, etc. “The…(pause)…cat…. (long pause) … crossed … the …. (pause)… road”? Maybe I get the words right, but there is no flow or fluidity. Math student also need a flow or fluidity with math fundamentals to be able to function/communicate at the next level, and after 32 years of teaching math there are many math students that have long pauses in their math communication-functioning. The ABC’s are not an end in themselves, but just a beginning in functioning and communicating. Math class is not an end in itself, but just a beginning of communication-functioning in more math, science, economics, etc. The point of math class is multifaceted, but mainly to bring the student to the place where they can function-communicate-have success at the next level. “Real Life” problems are not the real issue. How many crates and boxes for 10 million cans of tuna is not real. C3PO and R2D2 used to be real. I agree that “Real” is relative. A confident and competent teacher is “the” must. “Why are we doing this math”? The confident/competent teacher will give students the security that they are really getting ready for the next level. The confident/competent teacher will give kids confidence in the fact that they are learning to function-communicate at the next level. The confident/competent teacher knows how to develop perplexity at every level of math and then the confident/competent teacher delivers. Kids and people in general learn best when they are perplexed. I couldn’t agree more. From my observations and experiences, students are (for the most part) magically intrigued by puzzles. I have baskets full of puzzles in my class. Students sometimes work with them and they yearn resolution. They’ll spend a few minutes on it, get stumped, give up, and then practically beg for the solution. It amazes me. I never get that reaction with a word problem displayed on the screen or a worksheet with practice questions. There’s something mystifying about students and puzzles. It’s a treat to watch students problem-solve, experiment, fail, try again, persevere and collaborate on puzzles. The trick (challenge) is finding mathematical opportunities/lessons where those same elements are infused within the process. I appreciate your challenge (or charge): Find those puzzles. They’re definitely out there. Let’s now move to the next step: executing the delivery of the puzzle, the classroom facilitation, and possible resolution. There are many variables involved, and what might work in my classroom won’t work in someone else’s and vice versa. Knowing your students is important, that’s for sure. Again, thanks for the challenge. Puzzles… onward bound. I feel like I’ve just been slapped around. Thank you. I copied something I read on Dan’s blog about this, and keep it in front of me. “The real test of whether a math problem is “relevant” is not “do you use this in ‘real life’,” whatever that means, but “do you want to solve it?” It’s not that you want to solve it because it’s relevant; wanting to solve it is what it means to be relevant. The questions they love and that they’re getting good at writing are the ones where the answer involves defending an opinion, for example comparing the relative values of food combinations and asserting that one was better than the other. They are also fascinated by the crazy questions like how much would it cost to buy all the snacks and drinks on the menu? One kid asked today, “How much time would be wasted if you saw Free Birds five times?” They will spend days solving each other’s problems, rewriting and revising problems that they realize are unsolvable, or are confusing because they are vague or have been poorly written, coming up with different answers, and resolving the discrepancies. Their questions are much more interesting than most anything I could come up with. Sometimes they have to be tweaked a bit, or nudged in a certain direction, but what’s most important is that they own the questions. I find that then they are much more motivated to find the answers. Given my experience with sixth graders, I feel pretty confident saying that–in general–hexagons and heptominoes are real to them, while doing math in the context of health insurance, hydraulic engineering, or hydrogen gas is considerably less real. Certainly, it is much harder to make the latter content and contexts real for them. I really believe this observation is rooted in my experience, but my curricular biases may be showing as well. I suppose that as parents, teachers and curriculum designers, we should be focusing on the ability to place students in situations where they need to “unpuzzle” themselves, and then use mathematical concepts and skills to resolve their “puzzlement.” Maybe I am (also) showing bias based on my position as a parent with two young children and a teacher of middle school students, but I don’t readily see my own kids or my students willfully trying to “puzzle” themselves. But there definitely is engagement when they need to get themselves out of the “puzzle.” This is the time when they are ripe for being engaged in their learning, when they’ll do the heavy lifting to resolve their cognitive struggles. It comes down to either fostering motivation or forcing motivation. 1. Even if those puzzles aren’t mathematical? 2. Do kids puzzle themselves in a successful 3act problem? Or is that a case of the teacher puzzling the kids? What’s interesting to students follows the same principles as what’s funny in a joke. A punch line’s comedic value is jointly proportional to how surprising it is, and to how easy it is (after the fact) to see the connection between the build-up and the punch line. With math, what fascinates kids is to see that things the imagine in their heads actually relate to what happens in the world. To them, math and reality are conceptually very distant. You can see this by trying a 3-act but leaving out Act 3. If you just tell them the “correct” answer rather than playing the tape, the task never leaves the world of math class artificiality. Students don’t show much delight. Similarly, if you do a 3-Act and students arrive at a correct prediction but don’t quite understand how they got there, then playing the Act 3 tape won’t help. It’s like a joke that takes too much explaining. In previous posts last year, you and your community came up with the idea of “is it perplexing?” as the proper test for the value of a prompt. I really like that expression. It covers all the bases as to why anyone should want to learn math. The word “puzzle” used in this post conjures up a narrower view of valuable prompts. Feel puzzled. Feel perplexed. I mean them interchangeably. More that the process of moving from the concrete to the abstract is a satisfying one, and generally absent from school math curriculum. I’m torn on the rest of your comment. The File Cabinet task is perceived as largely value-less for a large number of individuals. (“Why is that yahoo doing that? Why would I care?”) I don’t know that your framework accounts for how a guess transforms those individuals from disinterested to interested. Someone somewhere (I thought you. Maybe me?) described a person’s sense that a verifiable answer to this question exists somewhere, an answer that will validate our guesses and different abstractions. My hypothesis is that some engagement in these tasks occurs when that sense is paired with a guess. Neither of the following is as interesting: a) a verifiable answer to a question that’s too abstract to guess at or b) a guess at a question that has no verifiable answer. That hypothesis is testable, and probably should be. Hypothetically, if a student knew with absolute certainty he’d have a career that wouldn’t require more than an understanding of arithmetic (and there are loads of those careers, of course) would you counsel him not to take Algebra? The real test of whether a math problem is “relevant” is not “do you use this in ‘real life’,” whatever that means, but “do you want to solve it?” It’s not that you want to solve it because it’s relevant; wanting to solve it is what it means to be relevant. The solution to the problem of relevance cannot be aimed at any location in the process of education other than what the students want. Man. Has it really taken me three years to appreciate that comment? Thanks for dredging it up. Perfectly put. Maybe I am (also) showing bias based on my position as a parent with two young children and a teacher of middle school students, but I don’t readily see my own kids or my students willfully trying to “puzzle” themselves. But there definitely is engagement when they need to get themselves out of the “puzzle”. I’m not suggesting the puzzles all already lie within the student. In addition to their role as explainers, teachers should consider themselves puzzlers also, posing these puzzles and helping students unpuzzle them. Ideally, though, a curriculum oriented around a student’s sense of puzzlement (intellectual need, perplexity, whatever) will help the student begin to pose her own puzzles. My assumption is that when a teacher puzzles her students, she is helping building their capacity to puzzle themselves. I’d like students to pursue big challenging non-mathematical puzzles in their lives outside the classroom, but I’m realistic about the mathematical objectives teachers need to meet. My hypothesis is that some engagement in these tasks occurs when that sense [that a question is verifiable] is paired with a guess. I bet that your hypothesis is true for math tasks, but I don’t think that it explains why people find this paradigm interesting. After all, humans often make verifiable guesses, but they don’t always find those questions interesting enough to pursue. So, what’s the theory that this is rooted in? Is it that people enjoy being correct? Is it that people are committed to their guesses in some way, as we’ve suggested in the past by talking about “ownership”? Or, alternatively, does the guess change the way that the student sees the problem? I’m torn on the rest of your comment. The File Cabinet task is perceived as largely value-less for a large number of individuals. I see your point. What I was imagining, in discussing the value of pursuing the File Cabinet Problem, is the social value of appearing smart or talented. The value would be about having solved the problem, not about having knowledge from the solution. Here’s how I might talk about the value of that “guess.” Asking for a guess is really a genius move because it does two things: (a) Making a guess helps make the problem more easily solvable and (b) It doesn’t sound like you’ve done anything to make the problem more solvable. The social value of having solved the problem remains high, even as you’ve made it easier to solve the problem. Also, I hope this sort of theorizing doesn’t strike us as too pessimistic. I certainly don’t think that this bare-bones theory could fully describe the myriad reasons people have for finding things interesting. But I think there’s value in minimizing our assumptions about human motivation at the outset. We already know that people like feeling and appearing good at stuff. Before coming up with an independent mental mechanism to explain mathematical motivation, I’d be inclined to base it on some known drivers of human action. Thanks for a thought-provoking post. I am currently a pre-service teacher, and I’ve been asking myself how to appropriately answer this notorious question from my students, “How am I EVER going to use this?” While I can turn to the last few pages of a lesson in the textbook and point to a few “real-world” problems, I know that’s not a sufficient or satisfying response when the “real-world” problems don’t seem relevant to the students, like you mentioned. Then, I could respond by trying to share that developing problem-solving skills is what’s most important, and though that may be true, I find it difficult to get students motivated in math unless they see some relevant or interesting connection to their lives. I feel that it does matter what types of problems we give them to consider. 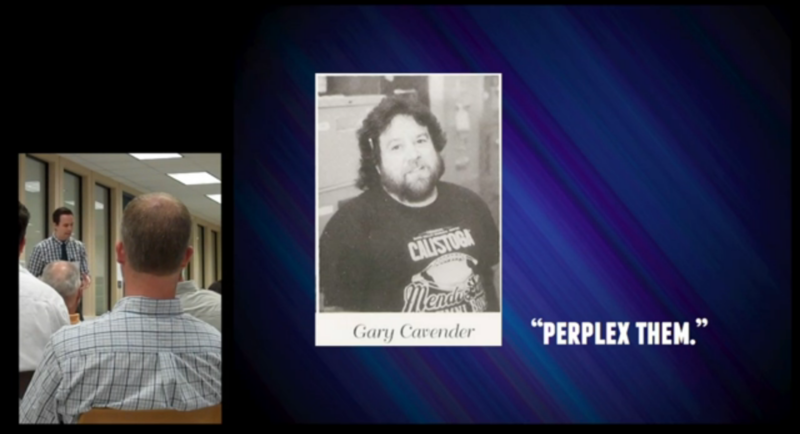 You mention that teachers can “Find those puzzles in the real world, the fake world, the job world, or any other world – it doesn’t matter.” If it doesn’t matter what types of puzzles we give them, how would you propose motivating students to engage if they do find the work terribly disconnected to their lives? Neither of the following is as interesting: a) a verifiable answer to a question that’s too abstract to guess at or b) a guess at a question that has no verifiable answer. I agree on a. ), but b.) can be interesting for statistical problems where there is no guaranteed answer (like my “is there anything mystical going on in the Bermuda Triangle one?”) where you can still lay odds in an educated way. Also, to be honest, while you’re big on the guess I have sometimes had 3-act style lessons where I went through guessing phrase with one class but skipped the guessing phrase with another, and had no change in student engagement. Where the guess really seems to help is when it simultaneously involves a competitive aspect; group A guesses 3 minutes 20 seconds and group B guesses 3 minutes 40 seconds, and they watch a video with rapt anticipation of outdoing the other. However, to get to that phase students usually have had to do a little work first; I’ve never seen them get very attached to their initial guess. I feel that it does matter what types of problems we give them to consider. You mention that teachers can “Find those puzzles in the real world, the fake world, the job world, or any other world – it doesn’t matter.” If it doesn’t matter what types of puzzles we give them, how would you propose motivating students to engage if they do find the work terribly disconnected to their lives? Hi Anna, thanks for the comment. Just to clarify: I think the type of puzzle we give students matters very much. There are satisfying puzzles and frustrating puzzles. My point is that it’s possible to form those puzzles from numbers, variables, cats, kittens, fake and real-world objects alike. I’ll articulate some thoughts about that at some point in this series. In the meantime, I’d encourage you to read Megan Schmidt’s recent post on a math task that is utterly fake – nothing real about it – that her students seemed to enjoy quite a bit. Not honors kids either. Kids who struggle with math. Any thoughts on what made it so engaging in spite of its fakeness? I have a couple but I’d rather hear yours. This is such an interesting conversation! This all makes me wonder about the point of having students solve “real world” problems—and I have to admit that this is something that I find myself drawn toward. Wanting students to be able use math as a way to understand and impact their surroundings. To see math as something that is obviously relevant to their lives. But this conversation is making me wonder what it even means for something to be relevant to our lives. I know what I think is relevant to students. I realize though, that what students want for themselves, is maybe a better measurement of relevancy. It may not be what I want for them, but if it is of interest to them, then it is relevant. Dan, you say, “The point of math class is to build a student’s capacity to puzzle and unpuzzle herself – no matter what form those puzzles take. Find those puzzles in the real world, the fake world, the job world, or any other world – it doesn’t matter.” So the question that comes to mind for me now is what puzzles students? I don’t think that just any puzzle will puzzle students. But maybe if something seems important enough, absurd enough, or fascinating enough, it may puzzle a student. And it may be more motivating if it is a puzzle that seems worth solving. An appropriate number sequence on the chalk board is engaging for most people of any age. It is not externally verifiable and doesn’t have anything to do with day to day experiences. My guess is that it is engaging because it is very obviously about figuring out how something works, it seems like it is possible to figure it out, and there is immediate and clear feedback. With so much math, real or fake world, the problem or dilemma involved isn’t presented very clearly (or isn’t even there) and it is cumbersome to get feedback on your answer. So the question that comes to mind for me now is what puzzles students? Great question! For the second time in a day, I’m going to punt. Believe me we’ll pick this back up, but for now I’d encourage you to look at puzzles you enjoy and ask “why?” For a starter, here’s Ben Orlin talking about Tic Tac Toe. That’s a puzzle that’s fake from skin to bone, but which doesn’t struggle to engage the public. Imagine the kindergartner asking “Where will I ever use the vowels?” One could answer that they are part of a cute ABC song or the ABC’s lead to words which leads to phrases which leads to sentences which leads to paragraphs which leads to pages which leads to articles which leads to books… But what if the youngster does not understand words yet? How does this young student conceptualize pages of words? Truthfully, trust in a qualified/competent teacher or parent is required. At some point reading and writing is part of everyday living just like different levels of math is part of “everyday chemistry” or “everyday economics” or “everyday nuclear physics”. How high should I go in math? Maybe the better question is where do you want to stop and limit your career choices or limit your ability to function? At what level do you want to limit yourself? What are your transitional goals? Do you WANT TO BE READY FOR THE NEXT LEVEL? Practicing the ABC’s and words leads to a flow and understanding of reading and writing just like proper algebra understanding leads to a flow and understanding of higher level math, science, business, engineering, etc. I contend that the biggest puzzle to solve is will I as a student be ready for the next level? Hearing over and over from students “When will I ever use this?” can be frustrating and it’s easy to blame the students either for their lack of motivation or their immaturity. However, this bad attitude toward math and math education is so deep rooted in our culture that it is socially acceptable (if not preferable) to dislike math. Just look on social media for lots of examples of “funny” t-shirts and e-card proclaiming, “another day went by and I didn’t use algebra once,” as if this is a justification for students dislike mathematics and dismiss it as unimportant. “Where will I ever use this math?” is not an immature question, and is not related to a question like “Where will I ever use these vowels?” The math that these disaffected kids are talking about is not what they learned in kindergarten, how to count or recognize numerals. They’re talking about the soul crushing exercises they are asked to complete in their pre-algebra classes, the inane word problems, or the torture they undergo dividing 4 and 5 digit dividends by 2 and 3 digit divisors over and over again. In that context it’s a perfectly reasonable question and one that has no good answer. They weren’t born hating math, but they really hate math now. That’s a shame. It was important for me to realize that when students ask “When will I ever use this?” they’re making a complaint about their present (feeling bored and stupid) as much as they’re asking a literal question about their future. I agree the “when will I use this” question arises because students “[feel] bored and[/or] stupid.” And as I was reading the comments to this post, I imagined myself teaching, but without enough engaging, puzzle-ful lessons to cover all topics and, therefore, still facing “the question.” The vowels vs. variables argument might be a useful way to help students put their math learning in context. As a matter of philosophy, I think it is important to introduce students to the idea that there is something valuable, something worth working for, outside the here and now. They may not buy it the first time, or the nth time, but you plant the seed. This is not an excuse for using boring, brain-deadening exercises and calling it teaching – not by a long shot. I’m only saying I think there is a balance to be struck. After (note the timing) you gain students’ trust by piquing their curiosity and showing them they can be successful, I think it’s also beneficial for them to learn to survive those possibly dry times between puzzle-ful lessons by realizing they are building up to something (a level of math fluency.) Maybe comparing this process with learning to speak and write would be useful in making that connection for students? @Gale, certainly engagement isn’t a binary on-off switch that can be thrown in the same direction for all students at all times. In every teacher’s class, there are times that are less interesting for different students than for other students at other times. It’s important for students to respond to those moments with perseverance or grit or whatever research-tested word we want to use. Still the question “when will I use this in the real world” remains one that should be handled carefully and perhaps not literally.